To transform high-resolution, low-angle images into a comprehensive cartographic record, researchers use ArcGIS. Researchers must know what the maps tell them before they can proceed any further scientifically. GIS is the cornerstone to managing MESSENGER's image data. The solar system's innermost planet, Mercury holds important clues about terrestrial planet formation. However, Mercury's proximity to the sun limits Earth-based observation (for example, magnified sunlight would fry a telescope's delicate optics). In 2004, the National Aeronautics and Space Administration (NASA) launched a surveillance orbiter to Mercury called MESSENGER (Mercury Surface, Space Environment, Geochemistry, and Ranging) to gain a clearer understanding of the planet's makeup and history. The first craft to enter orbit about Mercury, MESSENGER began beaming back high-resolution, low-angle images of the planet in 2011. To transform that data into a comprehensive cartographic record, researchers at the Department of Terrestrial Magnetism at the Carnegie Institution of Washington process the data in ArcGIS. 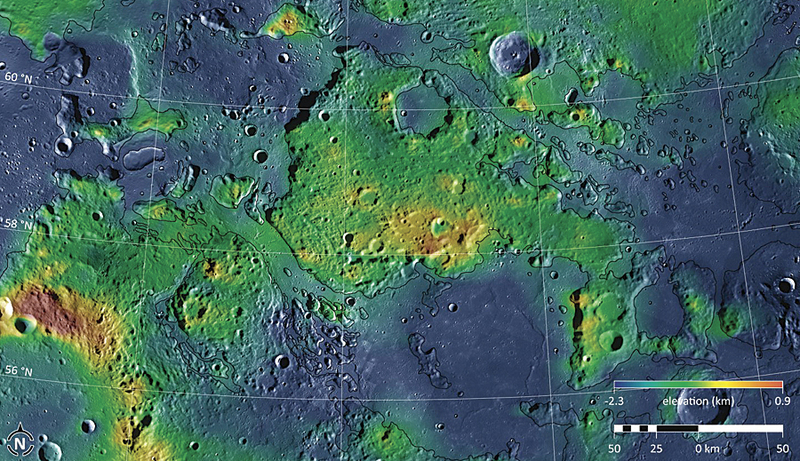 A number of outflow channels on Mercury resemble rivers on Earth but in this case have been carved by lava, seen here with a combination of photogeological and topographic data from MESSENGER. Of all the inner planets—Mercury, Venus, Earth, and Mars—scientists know the least about Mercury. Much of what we do know came from flybys of the planet in the 1970s by NASA's Mariner 10 probe, which discovered that Mercury generates a magnetic field (making it the only terrestrial planet besides Earth known to have one) and hosts some of the largest-known impact craters in the solar system. Those and other intriguing facts inspired the design of the MESSENGER spacecraft to expand our knowledge of Mercury and, possibly, the evolution of the inner solar system itself. Clean, high-resolution basemaps of a planet's surface provide a foundation for scientists to begin their investigations. Without a large-scale depiction of an area and its features, context cannot be determined, and comparisons with other areas—and with other worlds—are difficult to make. "Only after making maps of Mercury can we start thinking about what geological processes took place there and how we might study them through laboratory work, numerical modeling, and analysis of analog terrain," says Paul Byrne, a geologist and GIS specialist with the Department of Terrestrial Magnetism. "We need to know what the maps tell us before we can proceed any further scientifically." Nearly all of Mercury's surface will be imaged in stereo to characterize the planet's long-wavelength global topography and to gain insight into the nature of its enigmatic landforms. To accomplish those goals, MESSENGER includes a wide-angle, low-resolution camera and a high-resolution, narrow-angle camera, which together continually acquire different sets of image data and transmit the information back to Earth. After the data is processed by MESSENGER personnel at Johns Hopkins University Applied Physics Laboratory in Laurel, Maryland, where the mission is managed, Byrne selects portions of the global image basemap for study within ArcGIS. "GIS is the cornerstone to managing all of MESSENGER's image data," says Byrne. "All remote-sensing missions require geospatial tools to transform information, such as photogeological and topographic data, into actual maps we can use." The MESSENGER mission to Mercury is now in its second year of remotely sensing the planet from orbit. MESSENGER team members will continue to transform data from the mission into maps within ArcGIS that will be made accessible to other planetary scientists through NASA's Planetary Data System. 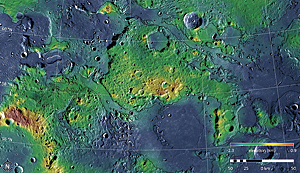 ArcGIS tools, such as 3D Analyst and Spatial Analyst, together with the ArcMap and ArcGlobe programs, allow Byrne and his colleagues to visualize Mercury in new and exciting ways. For more information, contact Paul Byrne, MESSENGER, Department of Terrestrial Magnetism, postdoctoral fellow, Carnegie Institution of Washington (e-mail: pbyrne@dtm.ciw.edu).